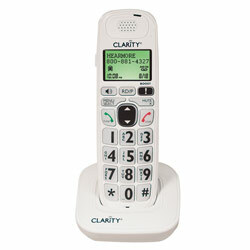 "Add to Your Clarity 40db Cordless Phone System"
This cordless phone with Caller ID display amplifies incoming sound up to 40 decibels and is 20 times louder than a standard home phone. DECT 6.0 technology provides clear, interference free communication. Low vision features include the largest keypad of any cordless phone, hi-contrast numbers, a backlit keypad that is easy to see at night, bright visual ringer and a large font Caller ID display. The Clarity D704HS uses patented Clarity Power technology that makes hearing easy again by eliminating feedback and distortion, minimizing background noises while managing soft and loud sounds. A handset speakerphone allows the user to listen hands-free at up to 40 dB, plus the system is expandable up to a total of 5 handsets.